We Indians love food that beat with rhythm on our taste buds. Achar or pickle plays a crucial role in Indian cuisine. 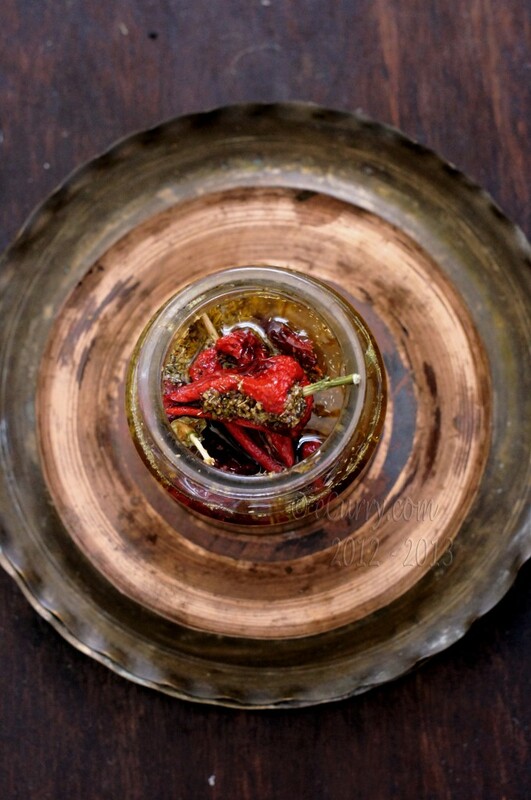 All Indian achar are invigorating; sharp, uplifting and stimulates the senses with a burst of flavor. They come in varieties, filled with inexplicable aromatic blend of flavors and are truly therapeutic. I miss those afternoons when we would steal away quietly and scoop out pickle from the jars sitting in the sun. Some tart, some sweet, some spicy and some with all the flavors blended together. Different kinds for different times and moods. There is an untold charm and satisfaction in furtively licking out the achar from the palm our hands. It is a pleasure of a “conquest”, just because we were not supposed to do so. That feeling is lost forever for I have no restriction now. It took me a while to get used to the “American” pickles; the cucumber and peppers immersed in jars of vinegars. Almost twenty years later I still cannot call them “pickles”. Pickles/achar with meal is quite a different story in India. They are more than just condiments and are often relished along with plain dal and rice or just over parathas, aloo parathas or any kind of bread. They are known to enliven any meal and every moment. Every home is known to have at least a few bottles of home made pickles of different kind ready to be eaten. 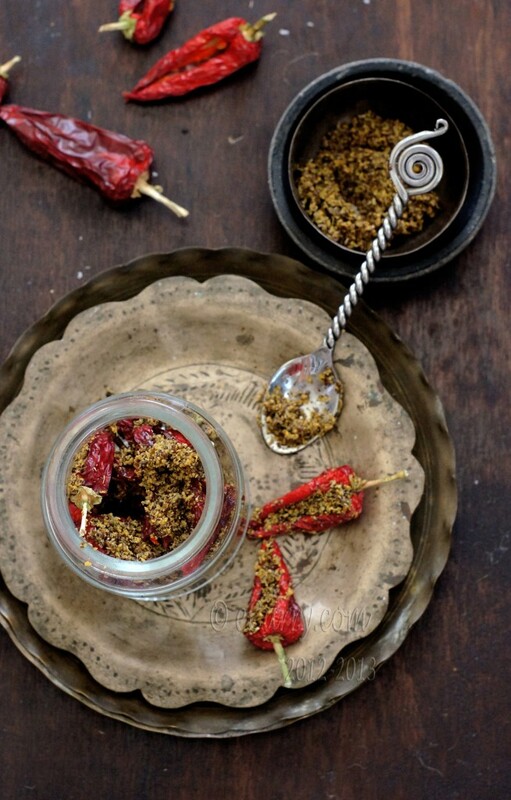 Every home has their own distinctive style of achar and the spice blends vary as much from one region to another. Any fruit or vegetable may be pickled and traditionally families in India make achar with seasonal fruits or vegetables. Some pickles in India are minimally cooked before storing, while some like this one does not require any cooking at all. High concentration of salt and oil help preserve the achar and make them safe to be stored for many months even without refrigeration. remove membranes and seeds. Wear gloves if you need to. This is my mom-in-law’s recipe. I do not know why I never posted this before or even made it myself. Of all the things we talked about when A and me met some twenty years back, one was this achar. Yes we talked of pickles and mummy’s aloo ka kofta and a few of his favorite food. Little did we know then that I would be food blogging! 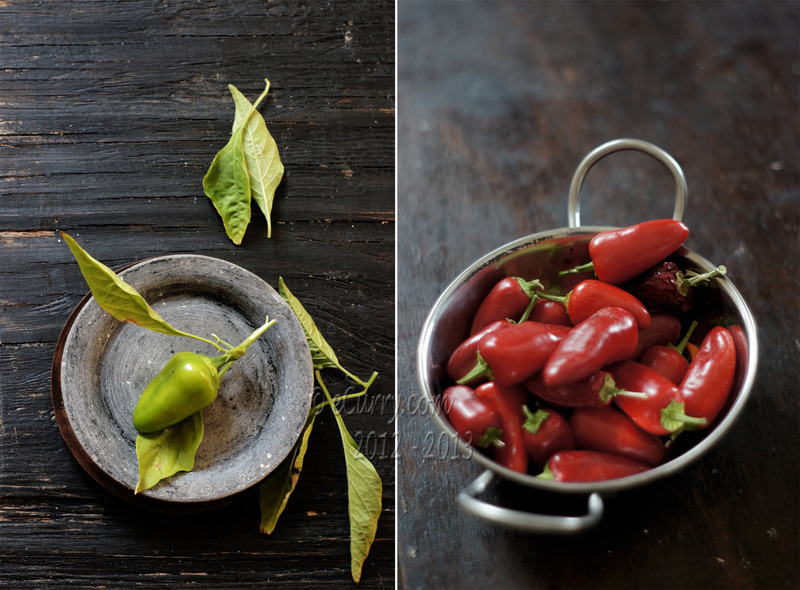 Two years back with she came to visit us, we found the red chilli peppers in the grocery stores, just the kind that are needed to make this pickle. They were probably the Fresno peppers, which looks similar to the Jalapenos only red in color and with thinner skin. She was excited beyond words and me too. For all these years here I never saw these peppers so readily available. She had pickled few pounds of these, and we ate for a few months even after she went back. This year in spring I had germinated the seeds that I was going to grow in our back yard. A small bag had the seeds of pepper with no label and I planted them only to find out few months back that they were the red chilli peppers that I had saved when my MIL visited. We had about twenty ripe ones at one single time and I decided to make achar with it. Now all the stuffed pepper achar do not have the same recipe. The way A likes it is with minimal amount of spice and absolutely no tart or sourness in it. We have tried buying all brands and kinds and have had others make it for us. But he ate none of them. I have the recipe exactly the way mummy makes it. I have made no changes except suggesting the olive oil if you would need to substitute the mustard oil. I know mustard oil is not easily available here and hence the suggestion. For the authentic taste of the pickle, using mustard oil is a necessity. The other spices that are usually used written down below as well but as optional ingredients. The strongest flavor in this pickle is that of mustard and fennel. *Note: Traditionally most pickles in the northern regions of India, especially the ones which are spicy are made in Mustard oil. The flavor and the strength of the mustard oil cannot be substituted with any other oil. If you do not get pure mustard oil, use Olive oil. The flavor will be missing but it will still work. Wash the chili peppers. Wipe them dry with a towel. Slit fresh red chillies and remove seeds. Remove the stems if you want. (It is advisable to remove stems; I did not it here as my peppers were really tiny and I had to hold on to the stem to clean and stuff them. A not very good reason, but I did as I did not to touch the peppers. 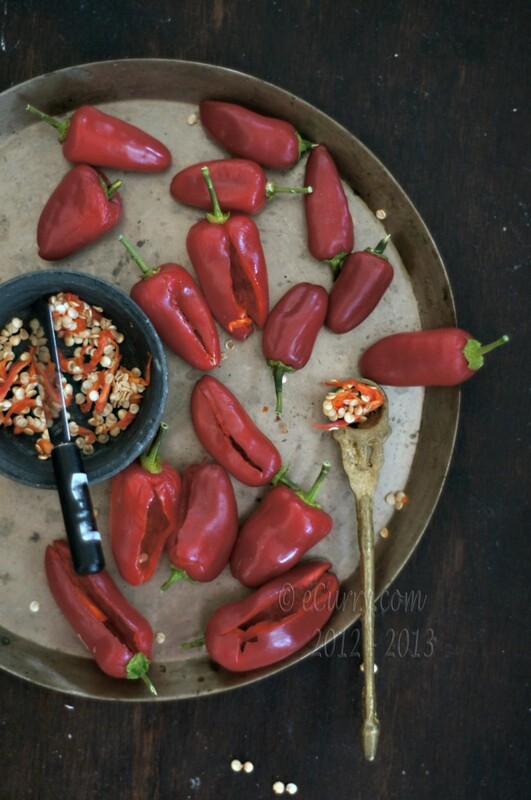 The heat of the pepper irritates the skin for many hours). These peppers are usually extremely hot, so take care and wear gloves if needed. Lay the peppers in a single layer on a paper towel on a tray and leave them out to dry. Leave them out in a dry and well aired space – by the window where there is plenty of sunlight or even outside are good options. Or they may be dried in the oven at 150F for about 4-6 hours. The extra moisture will dry up from the peppers and there are less chances of them going bad when stuffed and pickled. The peppers should be wrinkled but not hard. They will also feel lighter with part of the moisture gone. Heat the oil to smoking hot and then cool completely. To make the masala/spice mix, take ground and powdered fennel and mustard, salt and turmeric (and if any other spices you are using), in a bowl and mix. Add two to three tablespoons of oil to the dry masala and mix. Adjust the amount of oil: it should be a crumbly but sticky mix, a bit drier than a paste. Stuff the peppers with this masala. Pour some of the oil in the clean, dry and sterilized jar. Pack the peppers tightly in the jar. If there are any extra spice mix left, put everything in the jar along with the stuffed peppers. Pour the remaining oil in the jar. Now cover the mouth of the jar with a light porous cloth. The jar is now to be left in the sun for about a week. The heat of the sun “cooks” the pickle. 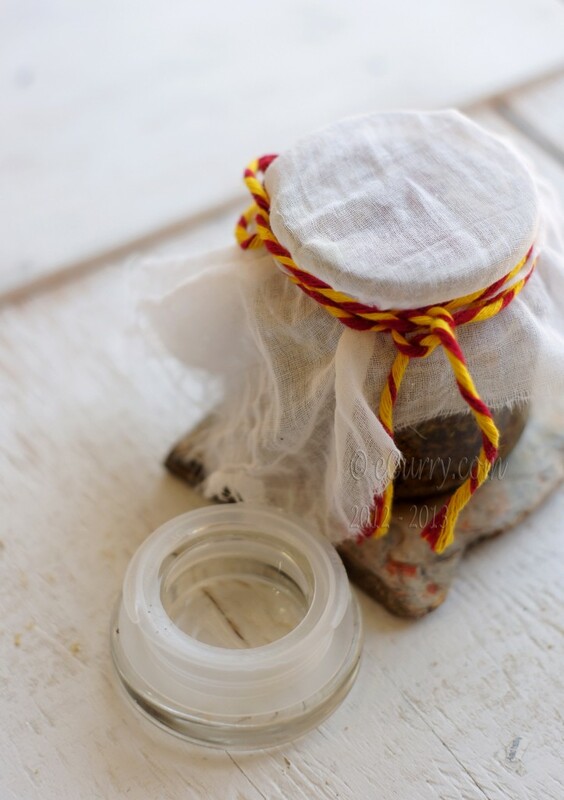 The porous cloth on the mouth of the jar prevents the dampness in the jar caused by the warmth. Every day once a day, give the pickle a gentle stir with a clean and dry spoon. Or lightly shake it up for the spices and the oil to be redistributed. The pickle can be served right after it is made, but it is best if it is allowed to mature in the sun for a while. The flavors settle and infuse during in the time. The pickle may be saved for many months. I usually keep the jar on the window sill a few times a week where is gets enough sun. An interesting recipe and a tasty pickle! I WILL make this soon. P loves chillies and I think this is a great way of making him fall in love with me all over again. the pickle looks outstanding Soma 🙂 Nice clicks!Loved the spoon in the 4th pic !! A neighbor would make a large jar of this and would give us every year. I completely adored this. Now I make do with the bottled ones available but none are as good. Yum Yum.. This achar, crispy paratha and ilaichi chai.. Perfect for Sunday breakfast! Sounds so interesting and very pretty, going to try it! Plus I heard that red chilli pepper kills cancerous cells. Aachar that is not tart or sour – I like them as well. I just love your utensils they are so so beautiful. And ofcourse your posts always blow my mind. This is my fav pickle. Beautiful photos Soma! I notice that you have asafoetida as an optional ingredient which is good… Haha, I remember a recipe on your blog that had the same ingredient in it so not knowing what it was, when I searched for it and found it I bought it online… And then I forgot what I was gonna use it for…. ;) i know you probably have quite a few recipes using it so I have to start digging into that bag! But in any case, I love the look of these pickled stuffed peppers! I am going to make this pickle soon. It looks delicious and will be good to warm up in the winter. I love this achar! I must make this. I hope I can find red peppers. Do u have any idea where I can find peppers similar to yours in Dallas area? Oh..those cute and plump red chilli peppers look so cute..I don’t get these here..and make the same pickle using green pepper (lighter colored plump ones). Beautiful clicks, Soma. 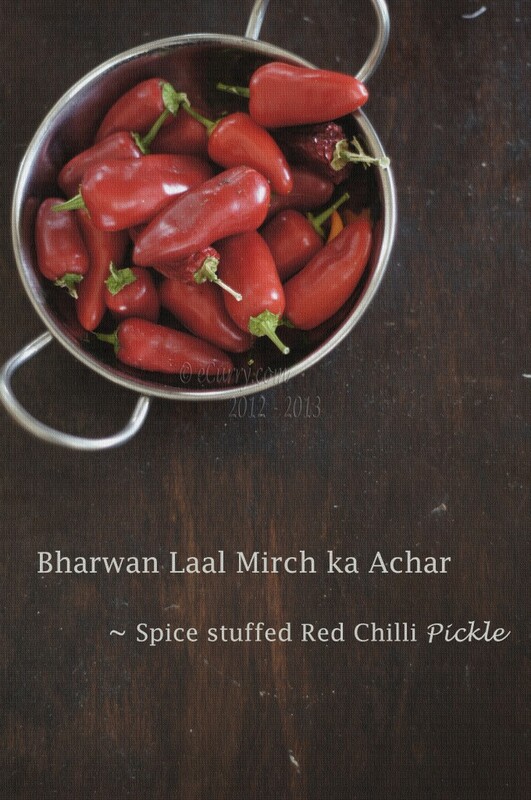 Now you’ve got me craving lal mirch ka achaar. So wickedly delicious! Please Let me know where can i buy this pickle [Achar]. I have searched in lot of shops but couldn’t get anywhere. Let me know if anyone knows any shop in Mumbai or thane where i can get is parceled from. Most Indian Grocery Stores will carry a Red Chilli Pickle. They might not be exactly the same as this recipe, but similar. Different brands will also have different tastes. Love your presentation and you have very nice and tempting collection of recipes..
First time here and loved your space, with neat presentation and many recipe collections. I’m following you on facebook to get in touch with you. Beautiful pickle. Can I make it with the green Chillies? I live in Hyderabad and we have these lovely plump salaan wali chilly. Yes I think you can. I have not personally done this pickle with green ones, but I have seen it done. Beautiful pictures and easy to replicate recipe. Thanks for sharing! My version in mustard oil leave a bitter after taste. Would you suggest I do anything differently to avoid the bitterness? Thanks! Can I do Laal Mirch ka Achar with cherry peppers insted of red chilli Pepper, to make them less hot ? Any peppers can be used. However peppers with thicker skin like jalapeno will have chances to go bad quicker. The thicker skin means more water content and that will create mold as it sits. Not sure if you can partly sun dry or oven dry to reduce that. Peppers with paper thin skin is best for this kind. Please let me know where do we get in Mumbai? Bharwa Lal Mirchi achar of Authentic -original from U.P ? 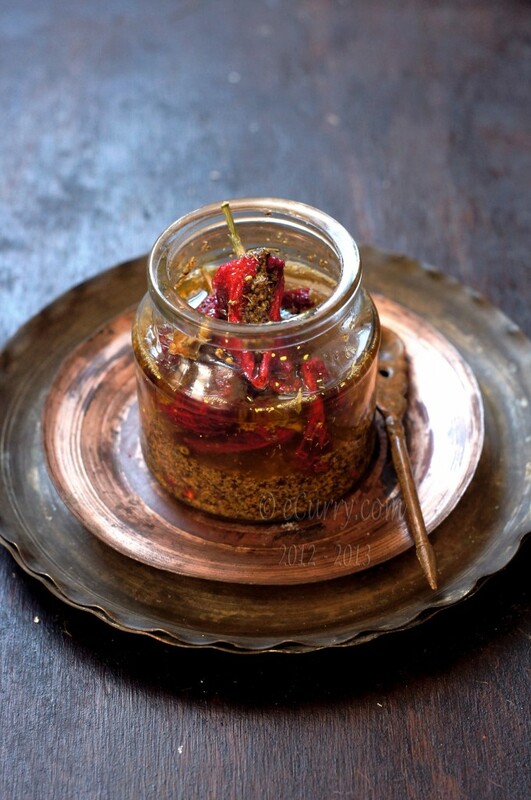 This recipe of Lal mirch ka Achar is sure to win many hearts. T reach more customers go and visit http://www.naaniz.com. It is an online marketplace to cater the needs of both seller and buyer.